I’ve been making tons of different types of crackers for Nolan this fall, trying to give him new snack options to send with his lunch bag. Most of the ones I’ve attempted are gluten- and grain-free because I am always looking for ways to increase Nolan’s protein and fat intake. So far, his favorites are these savory baked flax crackers flavored with nutritional yeast–I think he could eat an entire batch of those in one sitting if I let him–but he also accepted the almond-sesame crackers from Elana’s Pantry. A raw cracker with sweet potato pulp and soaked buckwheat did not fare so well. These chocolate brownie crackers, which I created to mimic the low-carb Skinny Crisps my mom brought home from Whole Foods last week, seem to meet with Nolan’s approval, although he is still recovering from the flu and being extraordinarily selective about his food choices right now. Skinny Crisps are a local company; they taste good and they are made with whole food ingredients, so as far as store-bought snacks go, they aren’t bad at all. Their $7 price tag for about 24 crackers, however, is prohibitive for our budget, and they were extremely easy to duplicate at home with even less sugar. Here you can see my crackers next to the Skinny Crisp original, which is topped with sprinkles (containing corn syrup, so they are technically not grain-free). 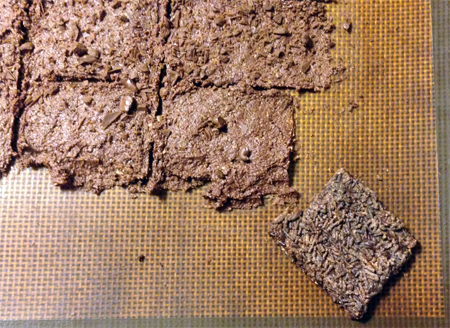 I used very finely chopped chocolate to top my crackers, and spread them somewhat thinner than the Skinny Crisps; another alternative would be Enjoy Life dairy-free mini-chips. I thought these were delicious, and even my gluten-eating husband, who still looks askance at most of my grain-free baked goods, enjoyed snacking on them. They were crispy and chocolatey, and I kept imagining them paired with some sort of cream cheese based dip, maybe with cherries. They could also be crumbled up and used as a chocolate cookie crumb crust for a pie or cheesecake; in that case, leave off the chopped chocolate topping. One of the pitfalls of baking with chickpea flour is that you really can’t taste and adjust the raw dough because no matter what you do, it tastes awful. Fortunately that quality doesn’t carry over once baked! Anyway, I might play with the amounts of stevia in the next batch because I detected a slight metallic aftertaste in the baked crackers. In food processor, combine almond meal, chickpea flour, cocoa, sugar, flaxseed and salt; pulse to mix. Add olive oil and pulse to blend in. Add water slowly just until a stiff dough forms; add vanilla and stevia and pulse one more time to blend. Spread thinly on a silpat or parchment sheet, score into diamonds or rectangles, and sprinkle evenly with chopped chocolate. Bake at 350F (auto-adjusted down from 375F in convection) for 15min, until firm and crisp. Doubles well. Source: Adapted freely from The Mindful Foodie.